Download a complete list of Antoine Mitchell’s experience as a conductor, pianist and teacher (PDF). Full CV available on request. Antoine Mitchell has been described by the Spanish music magazine Ritmo as “one of the truly most important of the new generation of English conductors” and is one of Britain’s most experienced conductors. He has conducted over 450 concerts with over 40 of the leading orchestras and ensembles in Europe and the Near East performing a repertoire of over 500 works. His performances of the 18th and 19th century have been praised, and especially those of French and English music. His 20th century repertoire includes many first performances and commissions and in 1996 founded the ensemble Oriflamme of which he is director. He was conductor of the Essex Symphony Orchestra and Southend Symphony Orchestra for over 20 years as well as of the Essex and Brentwood Youth Orchestras. He was born in Normandy, educated in England and studied at Trinity College of Music and the Royal Academy of Music, where he won the Ernest Read Prize for Conducting and the RAM Club Prize. His teachers included Maurice Miles for Conducting, John Gardner for Composition, George Rogers for Piano and Geraint Jones for Harpsichord. Subsequently, on the recommendation of Riccardo Muti and Bernard Haitink, he studied with Franco Ferrara at the Accademia Musicale Chigiana in Siena, where he graduated with Diploma di Merito. He conducted the Sofia Philharmonic and Russe Philharmonic and studied also with Carlo Maria-Giulini and Paul Badura-Skoda. After graduating, he conducted various orchestras and worked as pianist and repetiteur for the English Bach Festival and Royal Ballet and he conducted 5 U.K. Premieres at his Royal Festival Hall debut with members of the Royal Philharmonic Orchestra. In 1991 he was appointed Chief Conductor of the Lublin State Philharmonic Orchestra and has also appeared in the concert seasons of, among others, the Czech SFR State Philharmonic, Cairo Symphony, Estonian State Symphony, Orquesta de le Communidad de Madrid and Czestochowa Philharmonic. He has conducted at the Kosice Spring Festival and the Janacek May Festival in Ostrawa and festivals in Chartres, Paris, Lisbon, Erfurt, and Weimar and at the Nalecow Divertimento. In 1993, he toured with the Lublin State Philharmonic Chamber Ensemble to England and Spain, where he began his association with the Festival Internacional de Primavera Andres Segovia. His concerts in Madrid were broadcast and he was invited by the Festival to return annually leading to many premieres in Madrid, including the Concierto Andaluz of Rodrigo and guitar concertos by David Loeb, Tristan-Patrice Challuleau, Carlo Domeniconi and Miguel-Angel Linares. 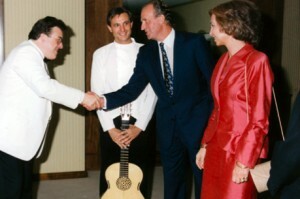 In 1994, he was awarded “Socio de Honor” and in 1995 he led the Orquesta de la Communidad de Madrid in a Royal Gala Concert for King Juan Carlos II and Queen Sofia for the centenary of the Spanish Press Association. In 2000 he made an acclaimed Millenium tour with gala performances of Mahler’s Fifth Symphony and Strauss Four Last Songs. From Antoine Mitchell’s comprehensive repertoire certain preferences can be seen – the works of Berlioz, Brahms, Dvorak, Elgar, Mahler and Tchaikovsky. 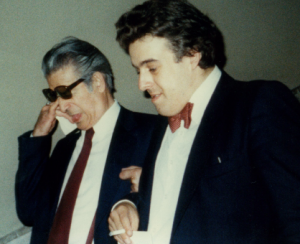 In 1999 he worked with Britten Sinfonia musicians in the Stravinsky and Beyond Festival. He has conducted the UK concert premieres of works by, amongst others, Andrzej Nikodemowicz, Tomas Marco, Jesus Guridi, Francisco Garcia Alvarez, Joaquin Rodrigo and Jose Luis Elizondo, and his concerts abroad have included overseas premieres of works by Elgar, Vaughan Williams, Walton, Delius, Brian Hall, Graham Whettam and Sir Malcolm Arnold. In 1994 he recorded the world premiere of the Flute Concerto by Maati Kuulberg with the Estonian State Symphony Orchestra in Tallinn and in 1998, conducted the film score by Jo van den Booren for “La Passion de Jeanne d’Arc”. As a composer, his song and instrumental cycle “Prelude, Chansons et Danse” was premiered in 1995 and recorded on CD in 1998 and he is currently working on a series of sonatas and suites for solo and accompanied wind instruments. Antoine Mitchell’s work in the theatre has included operatic performances of Carmen, Il Campanello di Notte, Cavalleria Rusticana, Cosi fan Tutte, L’Elisir d’Amore, Fidelio, Rigoletto, La Vie Parisienne, Le Villi and Der Zigeunerbaron as well as guest appearances with London Festival Ballet and Portuguese Sao Carlos National Ballet. He has worked with some of the most distinguished soloists including Gonzalo Acosta, Andrzej Bauer, Vladislav Blaha, Nigel Cliffe, Michael Davis, Philip Fowke, Erich Gruenberg, Reine Flachot, Timothy Hugh, Artur Jaron, Piotr Paleczny, Artur Pizarro, Joanne Thomas, Julian West, Louise Winter and Ramzi Yassa. He is the pianist of the Moray – Elgin Trio and is in demand as a soloist and accompanist and has directed concertos from the harpsichord and piano. He has given courses in conducting and piano interpretation, and has broadcast for the BBC World Service, Spanish and Polish Radio and Television and received arts awards for conducting and standards in orchestral performance. He is a member of the Royal Society of Musicians and in April 1993 was made an Associate of the Royal Academy of Music, which is only offered to past students who have achieved Distinction in the profession. He moved to Warwickshire in 2004 and has since formed a notable violin and piano partnership with concert violinist and former CBSO soloist Jeremy Ballard giving recitals including sonatas by Bach, Beethoven, Brahms, Debussy, Delius, Elgar, Grieg, Mozart and Schubert. During this time he has developed Oriflamme into one of the leading orchestral ensembles in the country giving a regular series of concerts in Warwick including annual performances for Amnesty International and the Mayor of Warwick. He has accompanied many distinguished soloists in concert and in 2012 he played a series of acclaimed Schubertiades with soprano Felicity Wright and violistAlice Crane earning praise from the Director of the Hong Kong Conservatoire. 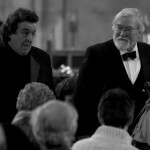 Concerts in 2013 include celebrations of the anniversaries of Verdi, Poulenc and Wagner and a towering Beethoven Emperor Concerto with Julian Hellaby. 2014 saw “ a stunning and highly memorable performance “ of Verdi’s Requiem “ A work demanding such exceptional control of dynamics requires an intense commitment from all its musicians – and that is what we had from every single participant. This is extreme singing for soloists and choir alike “ . A moving concert for the Mayor of Warwick in March became a tribute to Rita Dawkins led by the Mayor of Coventry and delivered with suitable poise and elegance. Forthcoming recitals include trio concerts, a piano programme entitled Papa and the Velvet Gentleman, combining the music of Haydn and Satie, a performance of Eddie Sauter’s Focus for Stan Getz with Oriflamme, Walton’s Façade entertainment, and in 2015 Copland’s Lincoln Portrait and Mahler’s 5thSymphony for Amnesty International.